Shauna and I have decided to get on board the diet train to drop some pounds. The big problem is that, being gourmands, we aren't willing to sacrifice good food to do it. Having been impressed with the Better Homes and Gardens cookbook we've relied on so heavily, Shauna grabbed the dieter's version and starting poking around for goodies that fill our stomachs without expanding our waistlines. Tonight marked our first experiment, feta-stuffed chicken. Can you believe this little dish holds only 231 calories per serving? Paired up with some white rice, it makes for a filling dish without a ton of junk. In a small bowl, combine the feta and cream cheese. Using a sharp knife, cut a horizontal slit in each chicken breast half to form a pocket. Stuff the pockets with the cheese mixture, using toothpicks to hold them together if necessary. Sprinkle with salt and pepper. Heat the oil over medium-high heat in a non-stick skillet until hot, then brown the chicken breasts until done, turning once. Remove the chicken from the skillet and cover to keep warm. Add about half of the broth to the skillet and bring to boiling. Add half of the spinach and cook until wilted, about 3 minutes. Remove the spinach, add the other half of the spinach and repeat. Combine all of the spinach in the pan, adding the nuts and lemon juice. 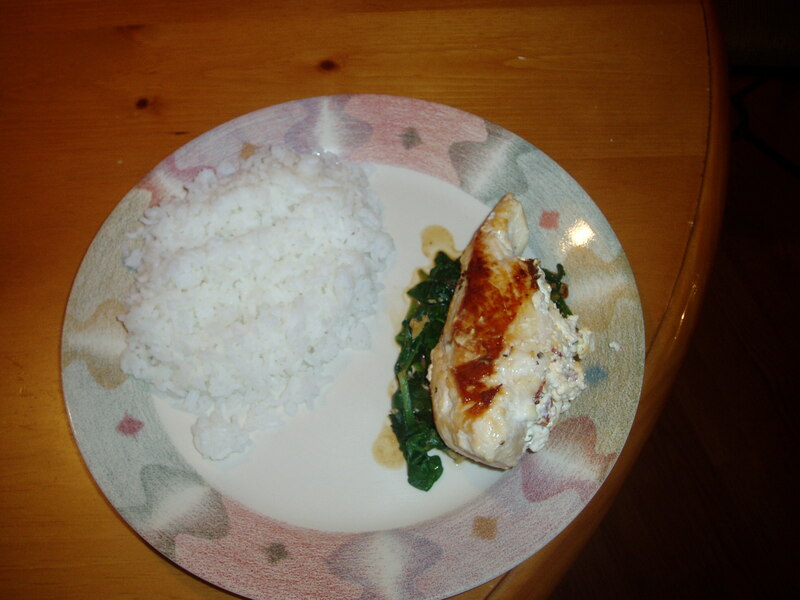 To serve, spoon the spinach mixture onto dinner plates, placing a piece of chicken on top. * If you don't have tomato-and-basil feta available, you can mix in 1 tsp of basil and 1 tsp of finely snipped oil-packed dried tomato with the feta. This is a very easy dish and takes around 30-45 minutes to prepare. Now you can wow your friends AND eat well. Who knew? Oh, my. That looks so tasty! Why must my friends torture me with pictures of food?? I’M PREGNANT! Next story Our puppy is a thief and escape artist.